I woke up really early, just shy of 5:30, and started getting all my stuff together. The tent had some condensation from the night and I hung it outside to dry completely. Breakfast was just as good as the day before and afterward, I sat outside with a coffee until it was time to go down to the boat. Weather was mostly sunny and pretty warm, good day to get back on the trail! The boat ride costs SEK 140:- if You’re a member of the STF and on the other side of the lake waits for the bus to let You continue Your journey. 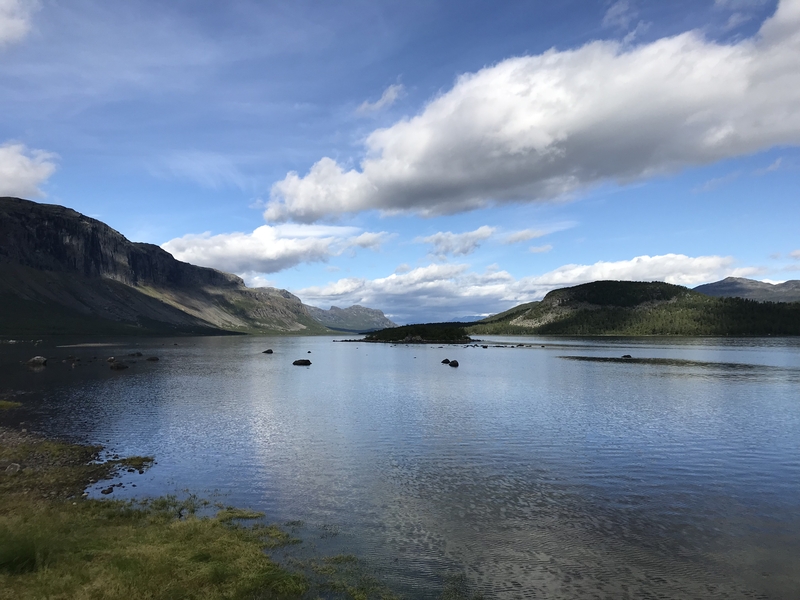 My next stop was Vakkotavare, the trailhead for the northbound Kungsleden. There’s basically no way to get around using the trail for the first stretch as in particular one river and a lake are hard to cross without bridge and boats. In Vakkotavare I met the same hosts as last year, Birgitta and Anders, and we had a nice chat catching up before I hit the trail at 1:30. After ascending the first part of the trail it gets very pleasant and easy to walk. I did the 16km to the lake ‘Teusajaure’ in 3.5h without hurrying and found two rowing boats on that side of the lake. This meant I could just take one and use to get to the other side, had there been only one, I’d had to row the distance three times to make sure there are one or more boats on either side of the lake. In that case, I would have waited for the schedule motor boat transport an hour later, now I didn’t have to. Though I have to admit I’d forgotten how lousy these rowing boats actually are, no fun at all to row the 1km across the lake, especially not as the wind had created quite some waves on the lake. It was a struggle and, once over on the other shore, I went into the cabin for a break, some coffee and to get dry and warm again. Turned out that it suddenly started raining while I was having that coffee and I ended up cooking dinner inside as well. Finally, the rain subsided to a mere drizzle and I went up the initial ascent to camp up on the plateau, I just felt I needed some free space around me after two nights at Saltoluokta. Found a really nice spot and got everything set up for the night!